Each year, the UK's Wellcome Trust selects its favorite images captured by any number of technological devices — from scanning electron microscopes to CT scans. This year's winning crop provide an intimate glimpse into these previously unseen worlds. 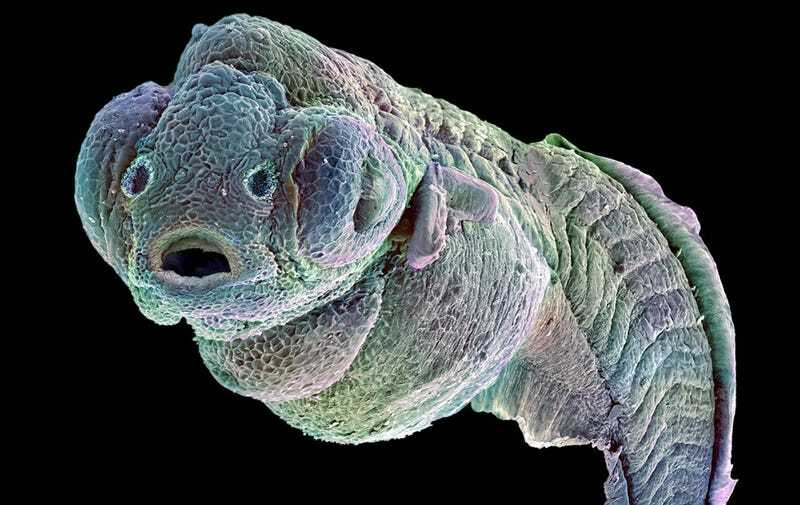 Top image: Scanning electron micrograph of a four-day-old zebrafish embryo. To capture this image, the zebrafish was physically attached to a stub by its tail and tilted to 65 degrees. Credit: Annie Cavanagh and David McCarthy. This year marked the 13th Wellcome Image Awards. The images, which were created by scientists, photographers, and artists from around the globe, give an up-close and personal view of humans, animals, technology, and the environment. All images and captions via Wellcome Trust. Dual-energy computed tomography (DECT, or dual-energy CT) scan of a patient who received a mechanical heart pump (coloured blue) while waiting for a heart transplant. Virtual 'slices' were taken of the patient's chest using X-rays (with this type of scan, the dose of radiation received by the patient is extremely low). The images were then used to create a 3D digital model that can be rotated, sliced and magnified as required. Credit: Anders Persson. Scanning electron micrograph of part of a thale cress flower, showing the male and female reproductive organs. The female part of the flower, the pistil (the blue feathery structure on an olive green stalk), is at the centre of the image and contains egg cells (ovules) housed in an ovary. It is surrounded by the male parts, the stamens, which have their anthers coloured light green and their filaments brown. Credit: Stefan Eberhard. Scanning electron micrograph of a crystal of copper indium gallium diselenide, or Cu(In,Ga)Se2 (commonly abbreviated to CIGSe or CIGS). CIGS is a semiconductor used to make thin-film solar panels, as it converts sunlight (solar energy) into electricity very efficiently. Credit: Eberhardt Josué Friedrich Kernahan and Enrique Rodríguez Cañas. X-ray projection of a brown long-eared bat hunted and killed by a domestic cat. The brown long-eared bat has relatively large ears and is common in the UK and across Europe. Credit: Chris Thorn. Photograph of a tick burrowing its feeding parts into the skin of the photographer's own leg. Credit: Ashley Prytherch. Computed tomography (CT) scan of the head of a seal. Virtual 'slices' were taken of the seal using X-rays. These were then used to create a 3D digital model that can be rotated, sliced and magnified as required to obtain a desired view. Different colours and degrees of transparency can also be applied to the various tissues. In the upper image, the skin has been made opaque to reveal surface details such as skin texture and whiskers, which are visible on the face of the animal. Credit: Anders Persson. Scanning electron micrograph of a nit or head louse egg (coloured green) attached to a strand of human hair (coloured brown). Head lice feed on human blood and live in close proximity to the scalp. Female lice lay eggs in sacs that attach firmly to individual strands of hair near the base of the hair shaft. Most will hatch within seven to ten days, and the newly emerged immature louse (nymph) will then need to feed on blood to survive. Credit: Kevin MacKenzie. Scanning electron micrograph of a kidney stone removed from Kevin Mackenzie, the creator of the image. Kidney stones form when salts, minerals and chemicals in the urine (for example calcium oxalate and uric acid) clump together and solidify. Kidney stones vary in size. Small kidney stones are often passed naturally, but larger stones sometimes get stuck in the kidney or in the tubes that carry urine out of the body. Kidney stones can cause a lot of discomfort and pain, and in some cases can lead to infection. If a stone cannot be passed naturally it may need to be surgically removed or broken up. Scanning electron micrograph of the surface of human heart valve (aortic valve) tissue. Clumps of calcium salts (the spherical structures coloured orange) are building up on the heart valve through a process called calcification. Over time this hardens the soft tissue and can eventually stop the valve from working properly, leading to heart disease. Credit: Sergio Bertazzo. Bird's-eye view of nerve fibres in a normal, healthy adult human brain. The back of the brain is on the left of the image and the left side of the brain is at the top of the image. Brain cells communicate with each other through these nerve fibres, which have been visualised by diffusion-weighted magnetic resonance imaging (DWI MRI). Credit: Zeynep M. Saygin. Scanning electron micrograph of a cluster of breast cancer cells (coloured blue). The cells have been treated with nanometre-sized particles (nanocarriers) carrying the anticancer drug doxorubicin. This is causing some of the cells to die (coloured purple) through a process known as programmed cell death, or apoptosis, which is where cells effectively commit suicide in a controlled, predictable way. Credit: Khuloud T Al-jamal and Izzat Suffian. Light micrograph of a miniature organism found in the sea, part of a group called Foraminifera (pronounced for-am-in-if-er-ra). This organism is approximately 1.4 mm long and has an outer shell made of calcium carbonate called a test. When the organism dies, its test is eventually turned into rock such as chalk or limestone on the seabed. This specimen came from the South China Sea and has a narrow neck with an external corkscrew-like thread. Credit: Spike Walker. Light micrograph of crystals of oxidised vitamin C (L-ascorbic acid). To make vitamin C crystals, vitamin C powder that had begun to oxidise was dissolved in water and a drop spread onto a microscope slide. This was warmed until enough water had evaporated to leave a thin film of solution packed full of vitamin C, which was then scratched with a needle to initiate crystal growth. Credit: Spike Walker. Light micrograph of a stained slice of a lily flower bud showing the male and female reproductive organs. At the centre of the image is the pistil, the female part of the flower, which contains six egg cells (ovules) housed in an ovary. This is surrounded by six male anthers (the white material) each containing four pollen sacs (the red circles), which are filled with pollen grains. Pollen grains contain the male sperm cells. After an egg cell is fertilised by a sperm cell it develops into a seed. Around the outside of the bud are three petals (small, circular in shape) and three sepals (large, triangular in shape). Credit: Spike Walker. Scanning electron micrograph of waste (sludge) from an industrial farming process, after having been burned. In the foreground, silver oxide structures (coloured pink, purple and green) and structures rich in calcium carbonate (coloured brown) can be seen. The background (coloured blue) shows the surface of a zirconia crucible (a container that can withstand very high temperatures), which was used to hold the sample as it burned. The sludge was burned to measure how much carbon, hydrogen, nitrogen and sulphur it contained. Credit: Eberhardt Josué Friedrich Kernahan and Enrique Rodríguez Cañas. Bird's-eye view of a micro-computed tomography (micro-CT) scan of a medieval human lower jawbone. X-rays were used to take 4800 virtual 'slices' of the jaw, which were made into a digital model. Colours and textures were then added to highlight the teeth (coloured blue) and bone (coloured brown). Credit: Kevin MacKenzie.